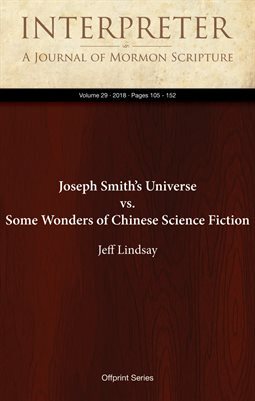 Abstract: Recently, Chinese science fiction works have received increasing attention and acclaim, most notably Liu Cixin’s The Three Body Problem, which has received international honors and recognition. Another Chinese physicist and science fiction author, Jiang Bo, also explores related issues in The Heart of the Milky Way series. Both works have interesting treatments of concepts relevant to Gospel perspectives, particularly the cosmic implications and teachings in the revelations given through the Prophet Joseph Smith. Joseph Smith’s cosmology gives us compelling reasons to rejoice in the miracle of the actual universe we are in and offers some profound insights that should at least raise eyebrows and stimulate thinking among the physicists and philosophers of our age. These insights represent profound and original breakthroughs in thought, solving significant problems in the world’s views on life and the cosmos.